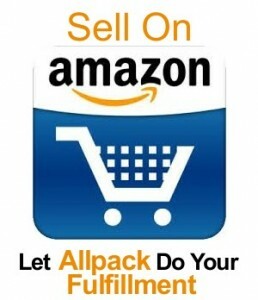 Grow your Amazon business by focusing your efforts on selling while letting us do the shipping. We quickly and accurately ship your orders helping you to achieve and maintain the highest of seller ratings. Use our API or developers to update shipment and tracking information automatically after your orders ship. Quick response times and communications with your customers will help to ensure positive feedback. You can always call us at (919) 529-2468 and ask to speak to a Fulfillment Specialist. In the body of the email please include the nuts and bolts of the order. We will need when the shipment is scheduled to arrive at Allpack, where to apply the item labels, item numbers, quantities and total numbers for each separate order. Attach to the email your product ASIN label format generated from Amazon. They should be in an Avery 5160 label format in a PDF form. If you need help, please check out the Amazon Seller help using the search refer, “Inventory Requirements”. Please let us know where to apply the labels as well. If you don’t, we will use our best choice. Once we receive the item labels, we will begin preparing your orders. A packer will apply the labels and case them in appropriate sized cartons. You will then receive an email update to the support ticket that you created. The ticket will now contain case-packs, dimensions and carton weights. Use this information to complete your ASN within Amazon and produce PDFs of your shipping labels and packing lists. Reply to the email and attach them. We will insert the packing lists and apply the carton labels. You will receive an email notification that the order has been shipped within 1 business day. Price includes handling, correspondence and normal packing materials. Fragile items may incur an up-charge for additional packing materials. There is a $25.00 order minimum per Amazon order number. We accept check, PayPal, ACH transfers and credit card. We require either a $100 deposit or prepayment of orders before releasing the shipments. If you choose to make a deposit, we will send you an invoice that is due upon receipt.